Fast delivery! Vast majority of orders arrive within 1-2 days. Free delivery for all UK orders. 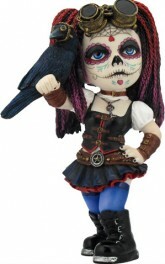 Clockwork Candy Gothic Girl with Raven figurine, part of a collection from Cos Play Kids. Made from a high-grade resin. Highly detailed and from the popular Nemesis Now range. Arrives in an attractive box. We accept all major credit and debit cards. All payments are processed securely using 256-bit Encryption. We can also accept payments via paypal or cheque. Our Price Promise and no-quibble Returns Policy are to ensure your peace of mind.